Sterling silver sparkles and makes these five pink topaz gemstones stand out in this stunning sterling silver pink topaz stackable band ring from Apples of Gold Jewelry. Whether you love the feminine feel of the genuine pink topaz stones, which have a pale pink rose color, or you can't help but adore the beaded design of the band of the ring, this beautiful ring is perfect for stacking with similar designs! The AA rated pink topaz gemstones measure 2mm each in size, and are just the right touch to this .925 sterling silver band, which also measures 2mm wide. 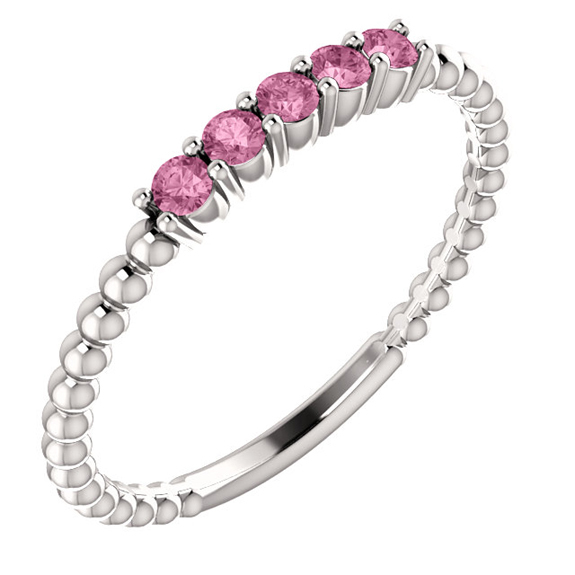 We guarantee our Sterling Silver Pink Topaz Beaded Stackable Band Ring to be high quality, authentic jewelry, as described above.